Unveiled at the 2016 Paris Motor Show, the stunning Lexus UX concept is our vision of a compact SUV for the ‘Urbanites’ of the future. The UX concept marks a new step in Lexus’ design history; a new kind of four-seat urban crossover which contrasts the almost brutal appearance and 4×4 presence of an off-roader with a low ground clearance and a coupe-like driving position. A futuristic ‘inside-out’ concept lies at the heart of the design, creating a strong synergy between the exterior and interior styling. At the rear, the bodywork flows into the cabin, forming the main structure of the rear seat headrests. Innovative detailing continue the ‘inside-out’ concept. The L-shape daytime running lights are positioned to pierce the main headlamp structures. The rear lamp design has a strong three-dimensional treatment, and integrated into the rear spoiler. 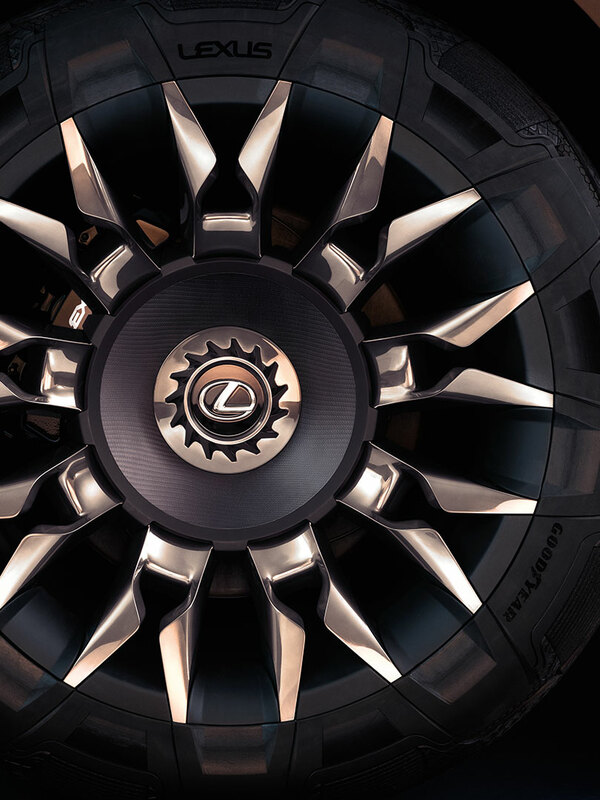 Even the UX concept’s tyres blur the boundaries; the rubber is carved by laser so that the wheel spokes appear to continue into the side wall, creating a seamless illusion that wheel and tyres are one single element. The elements that make up the exterior are linked together by highly sculptural, sensual surfacing, reminiscent of classic sports cars. This architecture is unique to Lexus, the strong horizontal design achieved through volume rather than merely character lines. The length of the bonnet is further emphasised, by setting the peak of the cabin further back. The front section of the cabin is as much about agile sophistication as it is about driver engagement. While the rear is styled as a welcoming sofa that wraps into the rear-hinged rear doors; the contrasting colour scheme providing the ambience and spaciousness of a luxury SUV. In place of a conventional dashboard, sharp, angular forms overlap and flow past each other to generate an interplay of shadows and contrasts. On each corner of the dash, there is a display screen that shows video from the side view mirrors attached to the outside of the doors. The vehicle’s on-board HMI (human-machine interface) technology has been designed to provide intuitive, three-dimensional displays, for drivers and passengers who are used to, and expect an always-connected environment. 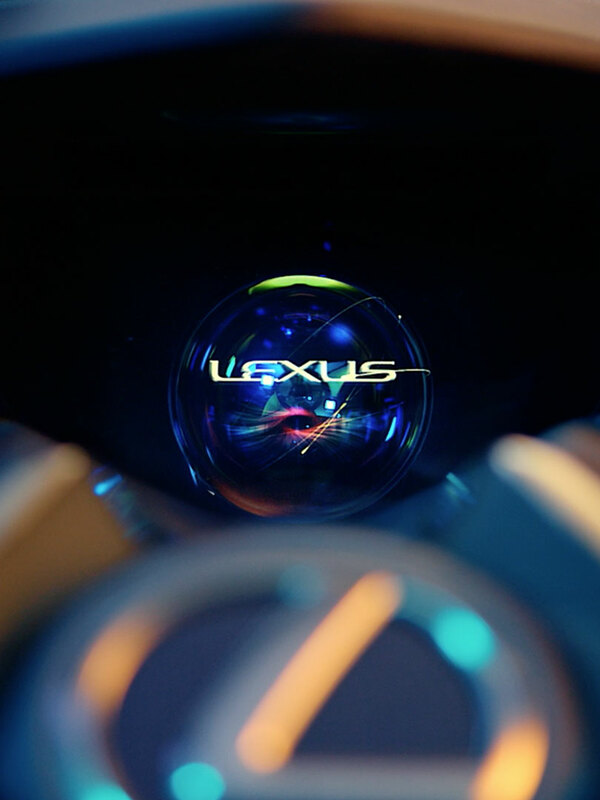 The driver’s instrument panel houses a transparent globe which appears to float, like a hologram and contains a combination of analogue and digital information. Above the centre console a crystal structure features a hologram-style display of air conditioning and infotainment information accessible by the driver and front seat passenger. 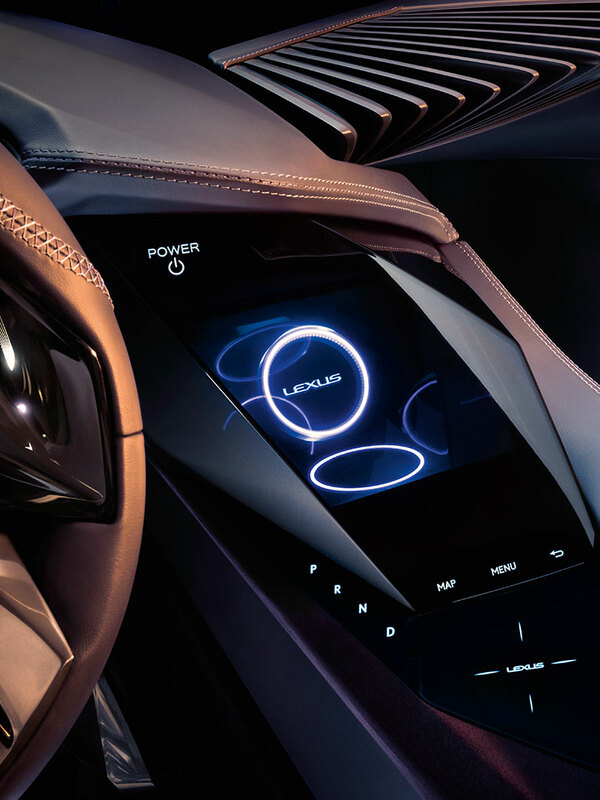 The Lexus UX Concept also adopts advanced electrical technology, such as electrochromatic windows and slim e-mirror camera housings instead of conventional door mirrors. E-mirror images are displayed on internal screens, integrated in a way that is not simply a design detail but informs the entire ‘inside-out’ deconstructed architecture of the dashboard. The fin motif of the A-pillar is repeated in a new audio experience for younger passengers – a detachable sound bar built into the side of the dashboard.